Need a super easy dessert that everyone will love? 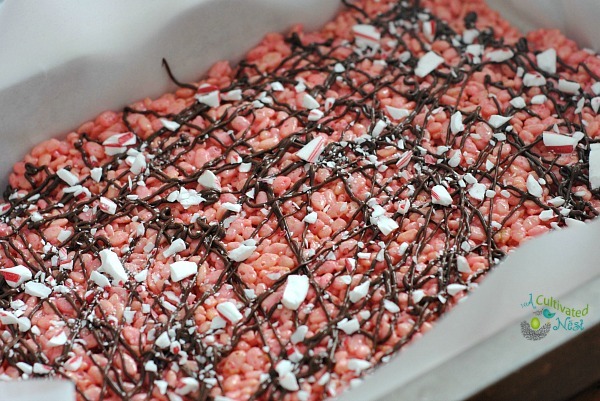 Try these Chocolate Drizzled Peppermint Rice Krispie Treats. 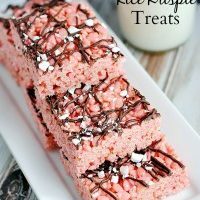 I mean who doesn’t love rice krispie treats? They’re the perfect combination of gooey and crunchy! Drizzling them with chocolate really takes an ordinary rice krispie treat and makes it into something special! FYI: I do believe I saw gluten free rice krispies at either Trader Joe’s or Kroger (so check your grocery store if you want to substitute those for regular Rice Krispies). Also, you can cut these into mini squares for a more grownup presentation. 1. Melt the butter and peppermint marshmallows on low heat stirring frequently until melted. 2. While the marshmallows and butter are melting, line a 9×13 baking dish with parchment paper or spray with some non-stick cooking spray. This will help tremendously with sticking. 3. Once the marshmallows and butter have completely melted, pour in the Rice Krispie cereal and stir well coating all the Rice Krispies. 4. Quickly pour the mixture in the baking dish and press down. Evenly. This is where sandwich baggie #1 comes into play. I wore it like a glove and sprayed it with non-stick spray and then evenly pressed down on the Rice Krispie bars making them even in the pan. 5. Pour the chocolate chips into a small microwave safe dish and heat in 20 second increments, stirring every 20 seconds until melted. Remove from the microwave and let cool a few minutes. Scoop the melted chocolate into sandwich baggie #2 and snip the corner of the baggie with the kitchen scissors. 6. Gently squeeze the chocolate out of the sandwich bag over the Rice Krispie treats. It doesn’t have to be perfect, I just criss-crossed and went back and forth. 7. Lastly, sprinkle with the crushed candy canes (or peppermints). They will stick on top of the melted chocolate. 8. Cut evenly into 24 squares. 2 squares = 1 serving. Store in an airtight container for 4-5 days. 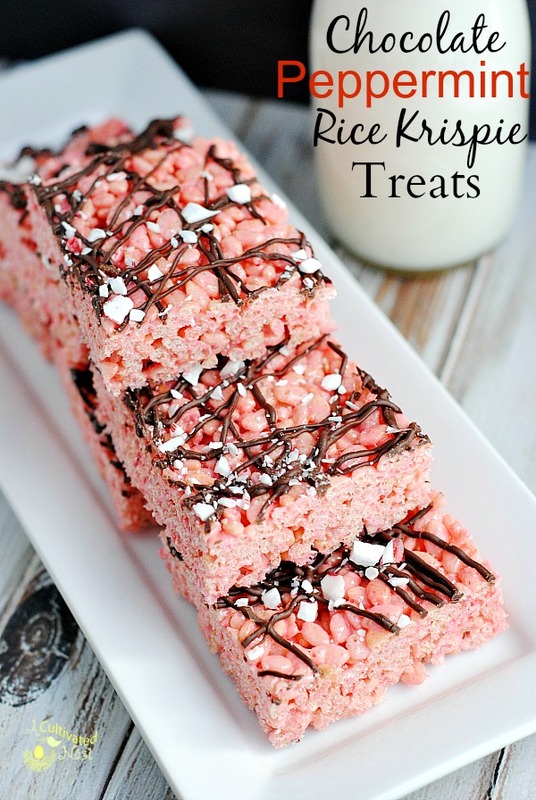 Let me know if you try this recipe for Chocolate Peppermint Rice Krispie Treats! Melt the butter and peppermint marshmallows on low heat stirring frequently until melted. While the marshmallows and butter are melting, line a 9×13 baking dish with parchment paper or spray with some non-stick cooking spray. This will help tremendously with sticking. Once the marshmallows and butter have completely melted, pour in the Rice Krispie cereal and stir well coating all the Rice Krispies. Quickly pour the mixture in the baking dish and press down. Evenly. This is where sandwich baggie #1 comes into play. I wore it like a glove and sprayed it with non-stick spray and then evenly pressed down on the Rice Krispie bars making them even in the pan. Pour the chocolate chips into a small microwave safe dish and heat in 20 second increments, stirring every 20 seconds until melted. Remove from the microwave and let cool a few minutes. Gently squeeze the chocolate out of the sandwich bag over the Rice Krispie treats. It doesn’t have to be perfect, I just criss-crossed and webnt back and forth. Lastly sprinkle with the crushed candy canes. They will stick on top of the melted chocolate. Cut evenly into 24 squares. 2 squares = 1 serving. Store in an airtight container for 4-5 days. These look amazing! Can’t wait to try them. 🙂 Visiting from Life On Lakeshore Drive blog hop! My computer came to a screeching halt when I saw those rice krispie treats! Yummy! I might be making these real soon. They’re so pretty; my granddaughter would love these! I think I could eat 5 of these!!! I hadn’t heard of peppermint marshmallows! I will definitely be purchasing some and trying these! Found at the #TurnitUpTuesday Linkup. – Pinned! Perfect for the holidays! Thanks for linking up with What’s Cookin’ Wednesday! These look great! A lot of my friends and family are gluten intolerant, so this would be a perfect Christmas treat for them! They look so good! Thanks for sharing your recipe at the Say G’day Linky Party. I just shared these on facebook–I think I’d like them, but I think my sister would LOVE them. Pinning to make this year! Hmm, I’d never really thought of customizing Rice Krispie treats before, beyond adding some sort of fruity cereal in the mix. But these look interesting! Looks great for feeding a bunch of teenagers! So fun! 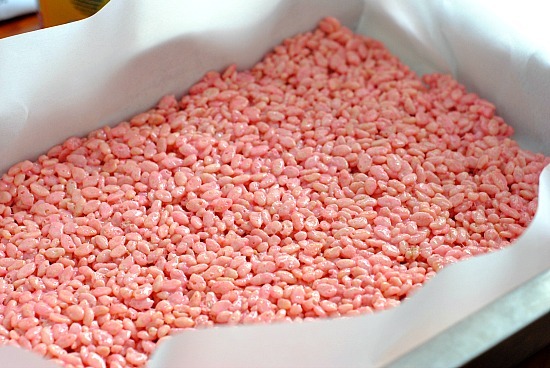 I love Krispy Treats…they work for any occasion. I’m visiting from Project Parade, congratulations on being featured. Following on pinterest. Hi Margaret, Thanks – they are so tasty! My kiddos would love me forever if I made this for them. It looks delicious! Thanks for linking to Show Me Saturday! Pinning! Thank for sharing. 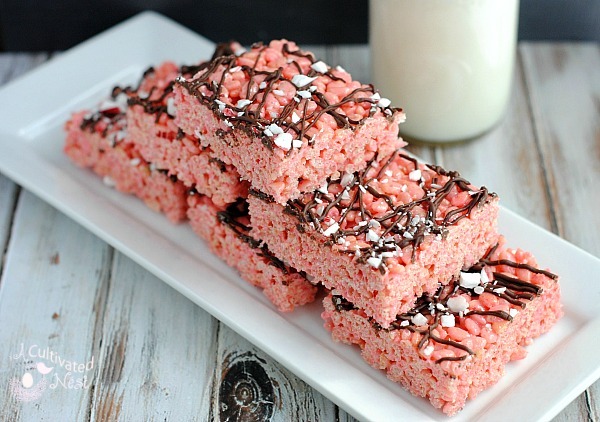 I was thinking wouldnt even chocolate rice krispies be yummy with the peppermint marshmallows Yummy! Might have to try that one! Could even drizzle white chocolate on top w/crushed Andes mints on top.